With employee turnover on the rise - a recent global study by IBM's human capital management practice revealed 47 per cent of the organizations surveyed said employee turnover has increased over the past two years - companies need to find out why workers are saying adieu. So, why not just ask them? Exit interviews help organizations understand what's driving colleagues away, pinpoint problem areas and increase retention. But few Canadian companies understand the exit interview's true value. Matthew Hindman wanted to be a stand-up guy when he walked into his first exit interview a few weeks ago. Now relocation project co-ordinator for the Canadian Institute for Health Information, his former employer, Meridian Credit Union in Toronto offered him an exit interview and he jumped at it. Despite feeling overworked and undervalued, Mr. Hindman liked his manager and many co-workers. He hoped if he came clean during his exit interview, maybe his candid comments would have some positive trickle down effect for the people left behind. "I felt good that I called some people out as exceptional. I said, 'If you don't do some things differently, these people will leave.' I didn't want the company to falter," he says. There are other reasons why employees spill the beans during an exit interview. Some are angry and need to vent, others were too fearful to talk about brutish or even unethical behaviour, but want to blow the whistle now that there's nothing left to lose. The truth is, not many Canadian companies offer exit interviews - at least not to everyone, or in a systematic way. That was the findings of a study by Dr. Nick Bontis, associate professor at the DeGroote School of Business at McMaster University. By his estimation, a mere 5 per cent of companies give exit interviews to everyone. Handled well, exit interviews help companies make peace with disgruntled employees, give the signal that the company can take criticism, and help managers discover their strengths and weaknesses. It can even help retain a good employee who might otherwise have left. The best reason to do exit interviews, however, is to uncover trends, says Donna Flagg, president of The Krysalis Group, a human resources and management consulting firm in New York. But you've got to ask the same questions. "If one manager is asking for some information and another manager is asking something else, it's useless," she says. Say eight former employees out of 10 divulge they're leaving for better pay. It's time to study the industry to see if you're too cheap. Finally, exit interviews uncover secrets. Ms. Flagg once worked with a company that discovered one of its managers was coercing employees to log in to the server using sexually explicit passwords. No one had the courage to blow the whistle until the exit interviews. 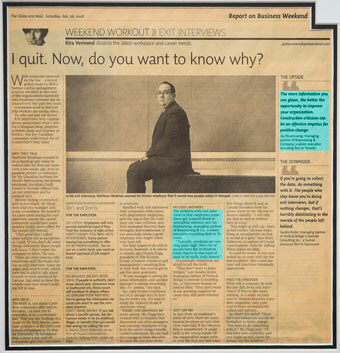 The problem with exit interviews is that employers sometimes get watered down or untruthful answers, says Jay Rosenzweig, managing partner of Rosenzweig & Co., a senior executive recruiting firm in Toronto. "Typically, emotions are running quite high. Not a lot of people have the inclination when they're in that kind of state to be really, truly honest." Occasionally employees are afraid to tell the truth. "They don't want to burn bridges," says Sandra Reder, managing partner of Vertical Bridge Corporate Consulting Inc., a Vancouver human resources firm. "They don't want to say anything negative because they still need references." In fact, from an employee's point of view, there are many reasons to refuse an exit interview, especially if the information is unrestricted: It could land in the wrong hands. Or the organization might write in your file that you said negative things about it and, as Canada becomes more litigious, resort to the old non-reference standby, "I will only say that so-and-so worked here in 2004." "You might as well say, 'burn in hell sucker,' because something as unsupportive as that is as bad as it gets," says Kerry Patterson, co-author of Crucial Conversations: Tools for Talking When Stakes are High. It could be worse. If you ever ended up in court with the former employer, they could use your exit interview comments against you. What will a company do with the raw data from exit interviews? If they're like most, nothing. In a study on turnover by Human Resource Executive magazine, only 4 per cent of firms systematically collect exit surveys. So what's the point? There isn't one unless you use the information to incite change. "You have to do something with it," Ms. Flagg says. "Or you have zero credibility and you might as well throw the money out the window." Do listen: Employees will only provide beneficial input if they trust the company to take action. Don't cherry pick who gets interviewed: Every person leaving has something to offer. Do be professional: You're not on a witch hunt; you want an honest appraisal of job experience. Do request an exit interview: If people in authority don't know about your obnoxious boss or loathsome job, these issues will continue to plague others. Do explain your motives: You're giving this information because you want to see the company improve. Don't name names: If you talk about a specific person, her behaviour needs to be so unethical, illegal, or harmful that you would feel wrong not calling her out. The more information you can glean, the better the opportunity to improve your organization. Constructive criticism can be an effective impetus for positive change. If you're going to collect the data, do something with it. The people who stay know you're doing exit interviews, but if nothing changes, that's horribly debilitating to the morale of the people left behind.